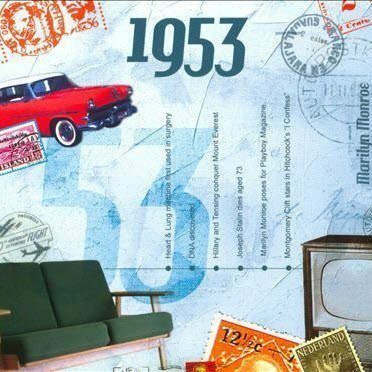 1953 The Classic Years CD Greeting Card, the two-fold card, together with the included 20-track compact disc featuring many of 1953's top artists . 1. Perry Como - Don't Let The Stars Get In Your Eyes. 2. Frankie Laine - I Believe. 3. Chet Baker - Love Walked In. 4. Doris Day & Johnnie Ray - Let's Walk That-A-Way. 5. Patti Page - (How Much Is That) Doggie In The Window. 6. Duke Ellington - Satin Doll. 7. The Ames Brothers - You, You, You. 8. Tony Bennett - Rags To Riches. 9. Johnnie Ray - Somebody Stole My Gal. 10. Rosemary Clooney - If I Had A Penny. 11. Carl Smith - Hey Joe. 12. Harry Belafonte - Venezuela. 13. Eartha Kitt - C'est Si Bon. 14. Hank Snow - Southern Cannonball. 15. Mario Lanza - Song Of India. 16. Chet Baker - Little Duet For Zoot And Chet. 17. The Four Lads - Istanbul. 18. Frankie Laine - Answer Me. 19. Guy Mitchell - She Wears Red Feathers.